On November 10th 1991 at 3:03pm,after 36 hours of labor,a warm and precious bundle was gently placed in my tired arms. The nurse exclaimed before I even laid my eyes on her, “She has dimples!” Hours later I was left alone in my room with her. It was then that I finally got to open my daughters’ blanket and fully explore for the first time, each little finger and tiny pink toe. She had a head full of blonde hair, as soft and as fine as a baby duck. There is no possible way to express in words what this moment is like. If you have a child, you know exactly what I am talking about. The memory of holding your first child is one you don’t forget. My daughter is turning 16 this weekend. Where has the time gone? This child who baptized me into motherhood with her ear infections, constant chatter, and independence-extraordinaire, my precious little girl is inching closer and closer to adulthood. She used to talk to me about princesses, Disney movies and parties for her dolls, but lately our conversation has turned to talking about cars, part-time jobs, boys and college. 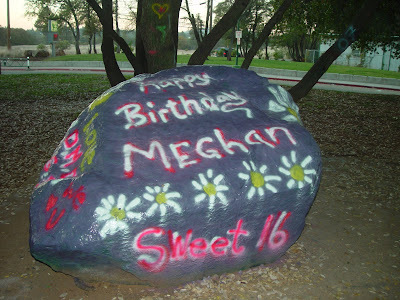 Last night, with the help of her brother David, we took our collection of spray paint and decorated a boulder. 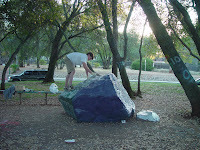 This boulder is special because it sits right in front of her school for all to see. In case any of you think this would be a great idea for yourselves, and don’t mind serving time for a misdemeanor vandalizism conviction… this high school allows people to do it, so it is actually ‘legal graffiti’. I will be the first to admit that none of our children are perfect (nor are their parents), but please allow me a moment to share what a blessing this child has been to us. Meghan is definitely our over-achiever kid. She has a full load this year and has taken quite a few AP classes. Yet she still has managed to keep a 3.85gpa. She has been gifted with a beautiful singing voice and is one of our children who actually listen when we tell them to floss (she has never had a cavity). She has a passion for godly purity and was asked to speak on this topic at our mother/daughter tea this year. Her words were straight from the throne as she blessed the young women with encouragement to be strong in their faith. Meg is on the children’s ministry worship team at our church and is a favorite babysitter of many local families. A love of musicals is an understatement, and her favorite actress is Audrey Hepburn and favorite movie…yep you guessed it…’Breakfast at Tiffany’s’. She takes a few moments before catching the bus each morning to do a devotion in her teen Bible(until now, she wasn’t aware I knew this about her), and I must admit that her teenage attitude has been much better lately. She has a heart that sees only the best in people and will fight to the death for anything she believes in. She is everything I wish I had been at 16 years old. So, with her 16th birthday upon us, I will spend a little time each day this week thanking God for blessing us with such a beautiful, strong, faithful, loving daughter. God says in His word, “Children are a blessing from the Lord.” Psalm 127:3…and to that I say a big AMEN! Happy Birthday sweetheart, we love you and are so proud of you. Remember Meg…you can’t dream dreams big enough for what God has planned for you honey.